I know many of you are wondering where I have been. Life has been ridiculously busy. So busy that sadly I have not had the time to do one of my most favorite activities in the world, blogging about Persian food! But I am back! So let’s get down to business! 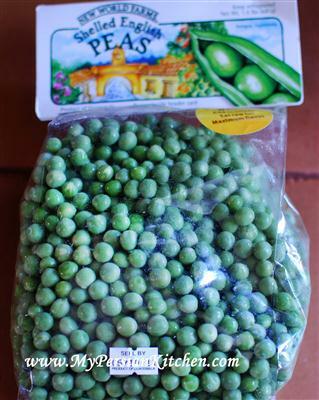 I have a major love affair with green peas! I love them! I love them most when they are fresh! Much to my delight I found the bag below at the market a few weeks ago and I had to buy it. 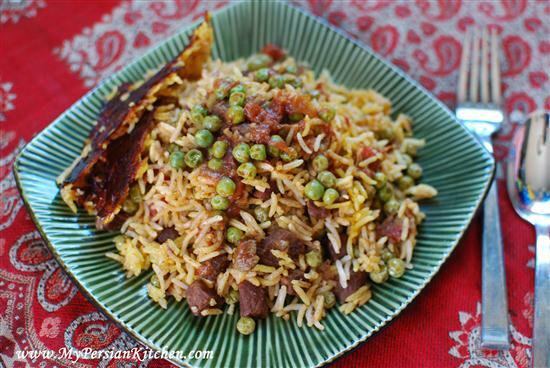 I was first introduced to Nokhod Sabz Polow, Green Peas Rice, last year. It was love at first bite, without a shadow of doubt!! I have to say that this rice tastes great when made it frozen peas, but it tastes phenomenal with fresh peas!!! Small dice onion and mince garlic. Saute in some oil until translucent. 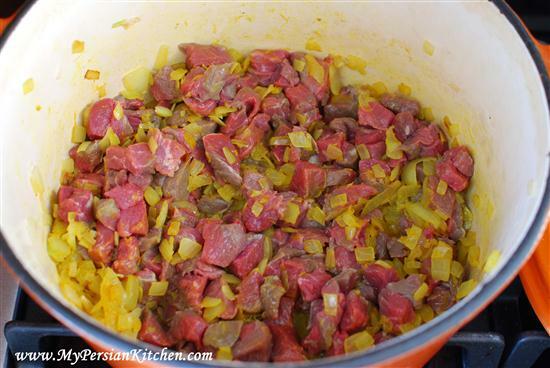 Cut meat in small bite size chunks, season with salt and pepper then add to onion. Cook meat until brown on all sides. 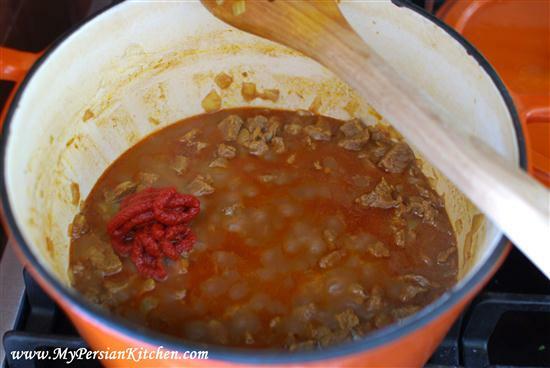 While the meat cooks drain the tomato juices from each can reserving the juice. There should be about 1 cup of juice per can of tomatoes. Add tomato juice to meat. Cover and cook on low for 1 hour. While meat cooks make sure that all the juices do not evaporate. 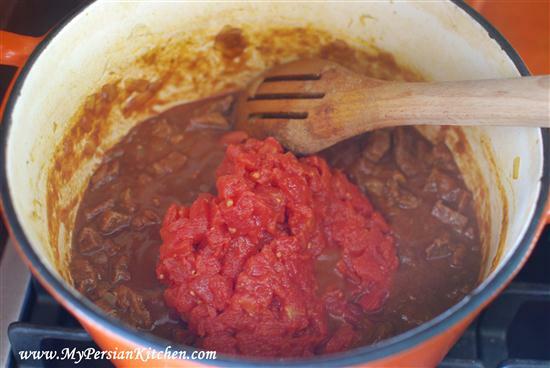 Once the meat has cooked all the way through add tomato paste and mix well. 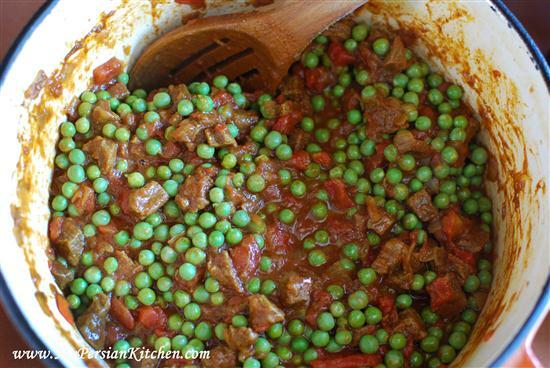 Add chopped tomatoes and 1 tablespoon of advieh; mix well. Add more salt to adjust seasoning. 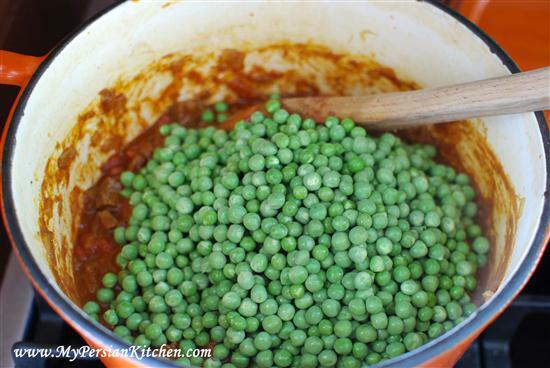 Add green peas and cook uncovered for about half hour. There should be very little juice left once the mixture is ready to be added to the rice. Add a thin layer of canola oil to the bottom of the pot. Add about 2 tablespoons of water and shake pan so that oil and water are mixed. 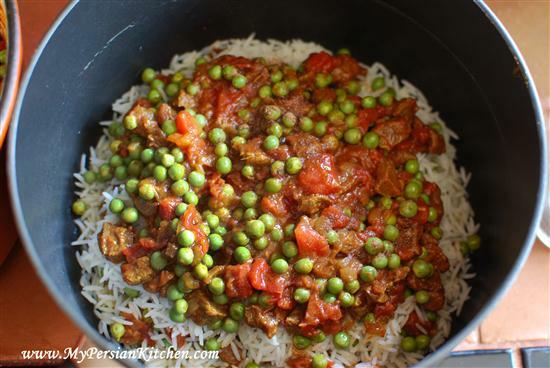 Add one layer of white rice, then add one layer of the meat and green pea mixture along with 1/4 tsp of advieh. Very gently move the rice and meat mixture around to combine. Continue layering until all the ingredients are gone. Be sure to finish with a layer of white rice. Cover the pot and cook on high for 10 minutes. Mix 1/4 cup of canola oil, or butter, with 1/4 cup of water. Pour all over the rice. Wrap lid in a towel and place back on the pot. Cook on low for 1 hour. I hope you enjoy this rice as much as I did. It was all pretty much gone rather quickly at our house, since the Sous Chef pretty much polished the whole thing rather quickly!! I think he may have really liked this rice!!!!!!!!!!!!!! Yum Yum Yum Yum !!!!! 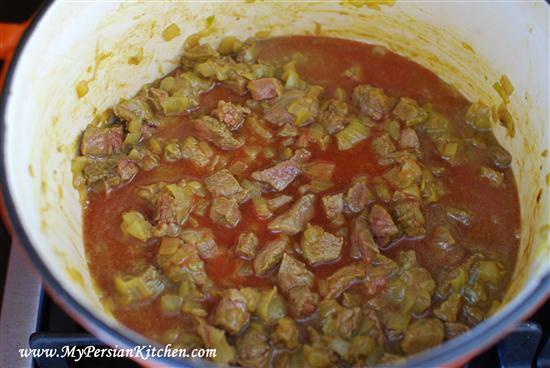 I truly enjoy your blog and want you to know that anytime I’m looking for an authentic Persian recipe I always trust you to have it I haven’t made this yet but I’m going to soon and then bring it to my Iranian friend who always appreciates the cooking of his homeland. m m m m m i love this food .im crazy.tnx a lot. .pls send me ” chakdermeh ” this iranian food is for bandar gaz in north of iran its so nice nice.tnx again.